Interesting Facts: When Zapdos flaps its glittering wings, it releases electricity that can potentially cause thunderstorms. It causes cause massive crackling and snapping sounds when it flies; these are attributed to the lightning bolts sheds when airborne. When stricken by lightning, it gains power. 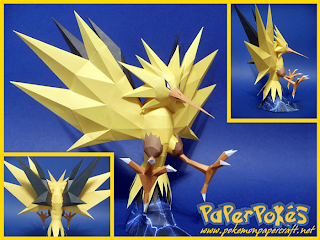 Zapdos reportedly appears only during thunderstorms, and is said to live among thunderclouds. However, it is rarely seen. NOTES: First off- be sure to fold all the sharp folds! This includes the wings, beak, legs and 'head spikes' in particular. Start with the halo of spikes around the face, and work inward towards the beak. Be very careful with the beak in particular, it's very small and easy to mess up. Then start to work down the back of the head, and attach the first set of Yellow Wings as soon as possible. Keep working down the body, and attach the second set of back, Black Wings once the body can support them. Same goes with the feet- be sure to attach the yellow 'leg caps' before attaching the feet+brown fur overtop of the caps. Close at the bottom with the 'skirt', being sure to attach the main yellow piece, then the inverted yellow piece to match it inside, and repeat with the black pieces. Two different 'bolt' patterns included for the base. Feel free to mix and match textures for the base in the pdo! Stony textures also work especially well. Edge ID files also included for reference. This is so awesome! You guys are the best. No way! this is too cool!!! Qual o melhor papel pra imprimir e montar??? Hey guys! its pokecraft. You should make Kalos region form x and y and start crafting them! Hey hen are you guys gonna add gen 6? I'm submitting 20 papercrafts of yours in a local show running where I live. We'll add 6th gen when we have a model to link into it. So, fairly soon.